Strange things showed up on my trails today. As I headed out I saw something green in the distance. Normally I would think nothing of seeing green. There are all kinds of shades of green on my trails. But this was a new shade of green. I’ve never seen anything quite like it. At least not on my trails. When I got close I found that somebody had left a little bag. I thought maybe they’d left me a present. But my person said it wasn’t for me and I had to leave it there. Okay person, you’d better give me some treats when we get home if I leave this. I left it. I’m still waiting for the treats. We headed on down the trail. 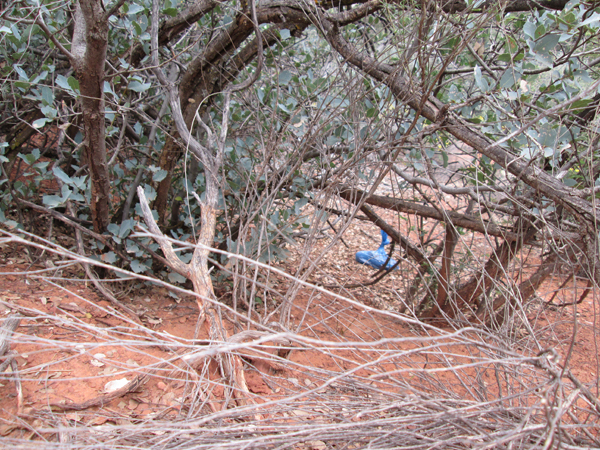 We hadn’t gone far when I saw something blue peeking out of the bushes. The only blue I ever see on my trails is in the sky so this was really strange. When we got closer I saw that it was another bag. A blue bag behind a bush. It reminded me of the time I found a blue Easter egg on my trails. 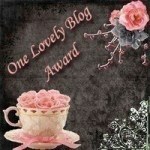 Person, this is like a treasure hunt. I know someone is leaving those bags for me to keep. I guess my person knew more than she’d been letting on because she decided to tell me what’s inside. 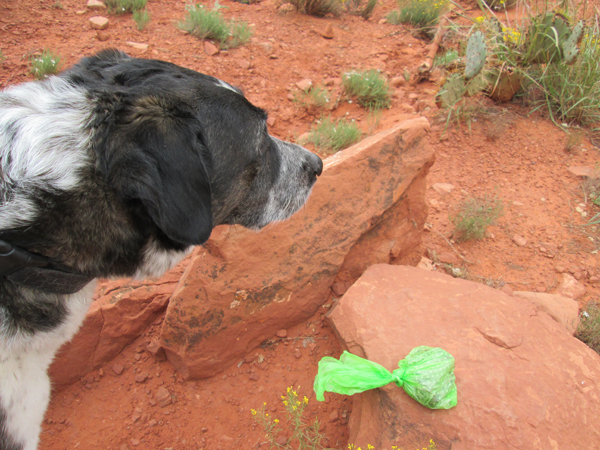 She asked me if I remembered those black bags that we get at the Pet Waste Station at the beginning of the trail. But those dark bags contain dark poop. 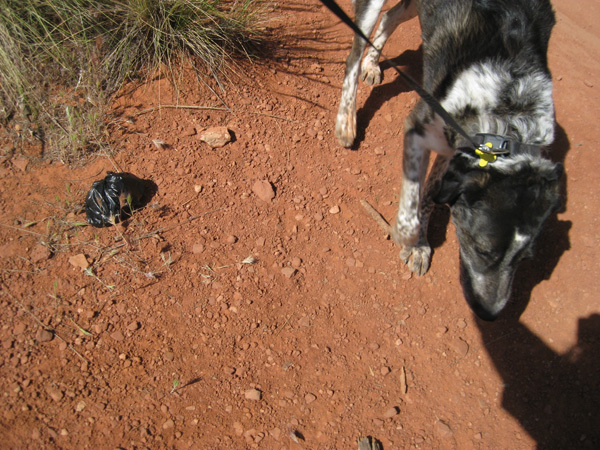 I’ve never seen a dog with blue poop, or green poop. I might have to put on my Detective Dog hat and investigate this. Patrecia, the green bag was missing the next time we passed that way. Some people take the bags to the trash on their way back. 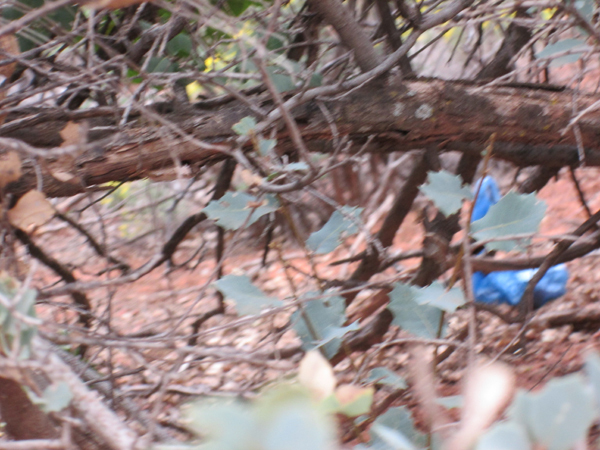 But that blue bag was still hiding in the bushes the next day. Naughty, naughty. Milo and Jet, I’m still checking it out, but the green bag disappeared. Maybe another colored one will show up in its place. Those strange poops are dressed to kill! They want to party…. Wait. What? Cupcake, I’m with ya’. I’m not sure what that would look like. Yikes! Aliens!? Some people say we have aliens in Sedona, so that very well could be. I’m not sure what color the aliens are though. pssst, Bongo – don’t tell anyone but when I was a puppy I ate a bunch of crayons & I made very colorful poops. Lola, that must have been cool. I’ve had a few things come out the other end, but never crayons. Kari, I’m still trying to figure it out myself. BZ, I guess I’ll have to investigate that. There’s got to be a pink one around somewhere. OMG, Bongo, you will met green and blue doggies on your trails tomorrow??? Kolytyi, that would be something I would want my person to take a picture of. Benny & Lily, I’m glad I could help increase your knowledge. Thanks Jennifer. I’m glad you enjoy it. Oh no….who those unmannered humans are……*sigh* At least they might be a little better because they put those poop inside the colorful bags…BUT! They should take it to somewhere like trash box. Kevin, the green bag disappeared. It probably got taken to the trash when the people were on their way back. But that blue bag is still hiding in the bushes. At least a black bag could have hidden better.